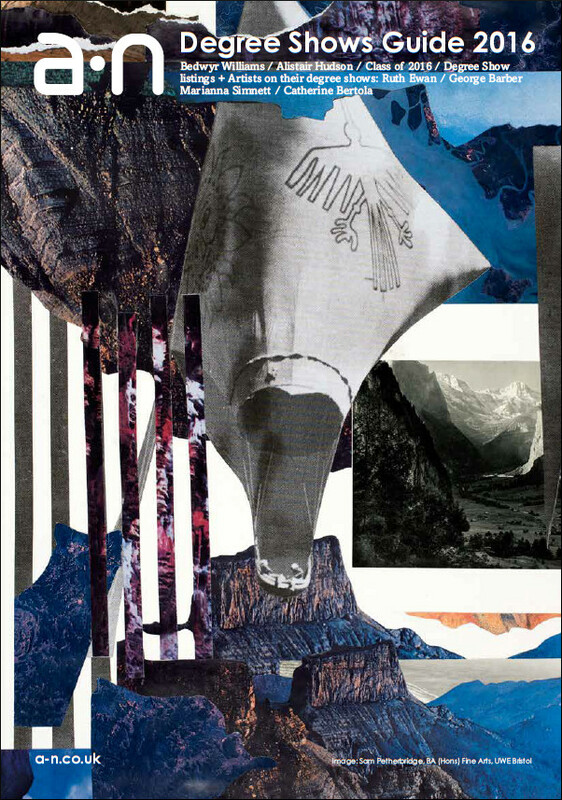 Dale Lewis is one of three Jerwood Painting Fellows currently exhibiting work at Jerwood Space, London. He talks to Fisun Guner about working with mentor Dan Coombs, his mind-crushing experience as an artist's assistant, and what inspires his open, chaotic and darkly humorous paintings. From a total of 400 open submissions, Dale Lewis is one of three painters chosen for the biennial Jerwood Painting Fellowship, a scheme that gives critical and financial support to early-career painters. 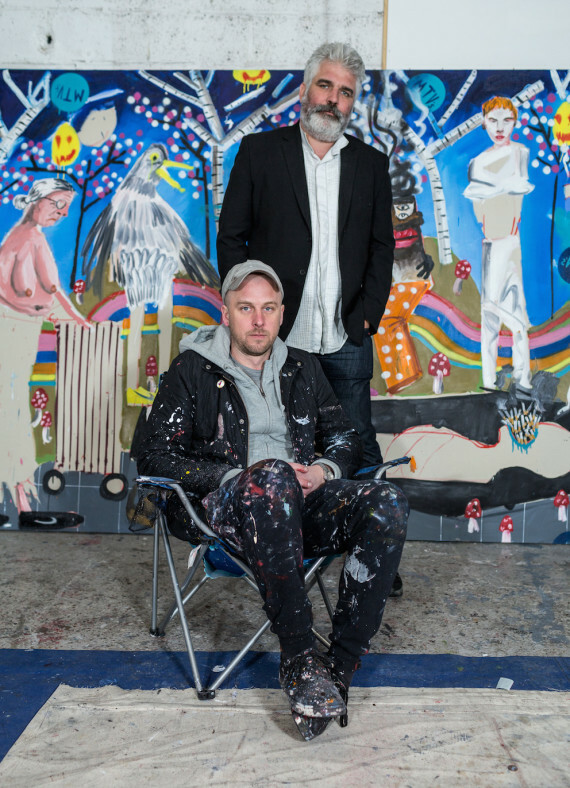 Set up in 2010 by the Jerwood Charitable Foundation, each painter is awarded a £10,000 bursary and paired with a mentor – Lewis has been mentored by the painter Dan Coombs (pictured above, standing, with Lewis). The year-long programme culminates in an exhibition at the Jerwood Space in South London, which then tours various venues in the UK. Lewis, 35, graduated with a BA in Fine Art from the University of Brighton. He then worked as an assistant to Damien Hirst for two years (solely on Hirst’s butterfly canvases, an experience Lewis admits to finding “mind-crushing”) and Raqib Shaw for four and a half years. Between 2014-15, Lewis was involved in the Turps Banana painting programme, which he says freed him from the smooth, photorealist style he had acquired working under Shaw. He lives and works in London. 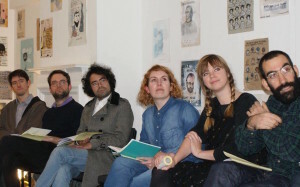 Did you get to choose your mentor for the Jerwood Fellowship? No. They choose you. Dan [Coombs] and I already kind of knew each other because he was involved in the Turps Banana painting programme I was on, where he was one of the mentors. How has it been working with him again? He’s amazing. Dan summed it up as being like one of these ‘80s New York or LA films, where there’s a rookie cop and an older cop and you get taken under their wing and they show you the ropes. He’s a wonderful man and really patient and kind and he just pushes you very gently towards the right kind of direction. We were interviewed on TV, on London Live, the other day, which was mortifying for me, and he was so helpful with that. What’s the most important thing you’ve learned on the fellowship? To be a bit more fearless, and not to worry. Just to do it for yourself and have confidence in your own work. Did you find any of the feedback difficult? Well, as Dan is a painter as well, it’s always impossible to look at my painting and not finish it in the way I think he’d finish it if it were his painting. But no, not really. He’s been really helpful with the formal structuring of my work. Your paintings are painted from memory, and are partly derived from situations you’ve directly observed, and it’s all filtered through a satirical viewpoint. Do you think humour in art is quite difficult to pull off? I don’t consciously try to do anything. I naturally like dark humour. I think that’s the way I look at the world and it naturally feeds into the paintings. I think I have a very British sense of humour. Your style has evolved quite dramatically in the last few years, hasn’t it? I used to make very smooth, photorealist paintings and I used to copy photos. I was an assistant to Raqib Shaw for four and a half years and I spent all my time doing incredibly detailed work – and it used to drive me mad. I mean, you do a very tiny patch of flowers and it would take all day. As a result I think my paintings got very tight and that was a really bad thing for my work. But when I stopped working there, suddenly my painting opened. Now I really hate photorealist paintings, and I don’t really like abstract paintings either. I think what I do now kind of lands somewhere in the middle. There are many references and fleeting allusions in your paintings – one sees Basquiat, Guston, early Hockney. And there are so many religious references too. Tell us about some of your influences. I like Basquiat because he’s chaotic and bright and intense and energetic, and I like early Hockney for the gay subject matter. As a student I’d pore over them for hours. I like Beryl Cook, for those social scenes of women in pubs, and Alice Neel and Maria Lassnig, so all that’s inevitably going to feed into my work too. And I like Martin Parr’s British seaside kind of thing. But I think at some point you have to break away from that. I’ve stopped looking at other people’s paintings so I can allow my own to surface. And now that I have a small body of work, I can reference my new ones against my old ones. I’ve probably made about 40 paintings since being on the Jerwood Fellowship, so I’m on this roll of recycling my previous images. 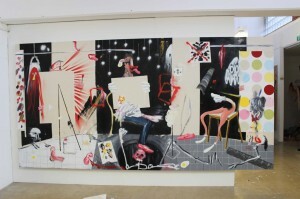 Your paintings are huge (200cm x 400cm). How long does it take you to finish them? Normally, one day. But I’ll probably be thinking of the story that informs the painting for years. For instance, you know when you grow up as a kid and there’s always this one strange person in your neighbourhood? Well, I painted Acid Man’s Funeral (above) built around a character who was like a legend. Acid Man was this guy who everybody said had taken loads of acid in the ‘80s, but he’d never come out of this state. It was completely untrue, but this was passed on so even the next generation knew who he was. But we found out one Christmas that he’d died and I made that painting of him watching his own funeral. So although the painting might take a day, it takes about 20 years or something to happen. I’ve read that you don’t do any preparatory sketches. You seem to rely on a lot of improvisation. Is that right? Actually, I normally make a small A5 drawing, but it might only be as simple and as quick as that. Most of my ideas of composition come from the National Gallery. Often I look at altarpieces, and all those small panels at the bottom, for ideas. They’re like the beginning of painting, where everything is really flat and amateur and that really suits the way I paint. 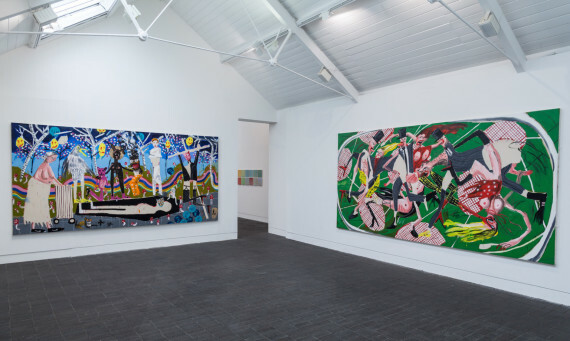 Dale Lewis, with fellow Jerwood Painting Fellowship artists Francesca Blomfield and Archie Franks, can be seen at Jerwood Space until 19 June 2016. Lewis will be in conversation with curator Norman Rosenthal on 4 June, 3-4pm. The exhibition then travels to The Gallery, Arts University Bournemouth, 7-25 August, 2016; BayArt, Cardiff, 12 November – 16 December, 2016; East Gallery, Norwich University of the Arts, 7 February – 18 March 2017.